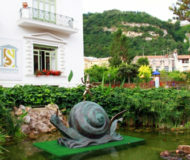 In the beautiful setting of one of the oldest and most beautiful villas in Sorrento, “Fondazione Sorrento” presents a highest quality program of art exhibitions. An exhibition about the cultural importance of several growed up in a century. Individual and collective experiences as emblematic signs of modernity. Rive dei Mari is not only a retroscpective, but a thought about the mysterious land of archetypes: by sea the centuries have brought dangers and hopes, myths and legends, storms and beauty. An event to rediscover and re-evaluate the Sorrento’s craftwork which will be comparated with schools and national and international Institution operating in the “Wood Inlay”. The Neapolitan crib at Villa Fiorentino: for the V edition the masters of this Neapolitan tradition that, since the seventeenth century, becomes an appreciate popular art even beyond the borders of the city of Neaples. Description: Here are the details on the 2015 program of events at Villa Fiorentino.